The stock photo of the Inglot AMC #75 Bronzing Powder looks like a dark mud shade. (The color differs depending on the computer screen settings.) 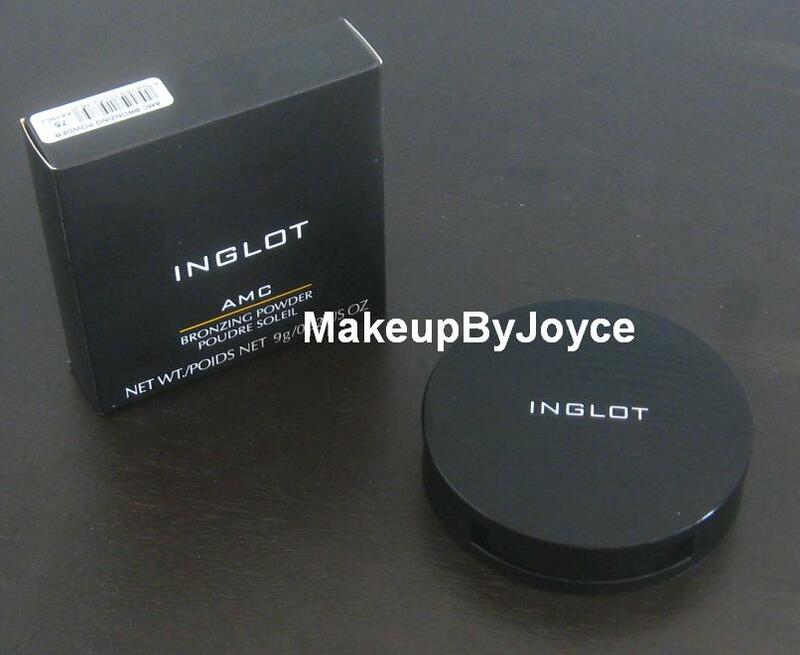 Not only is the stock photo unhelpful, but Inglot doesn't provide any color description on their website. When I swatched AMC #75 on my arm, it did NOT show a hint of orange at all and did not look like mud either. It leans more to the golden and bronzey side. 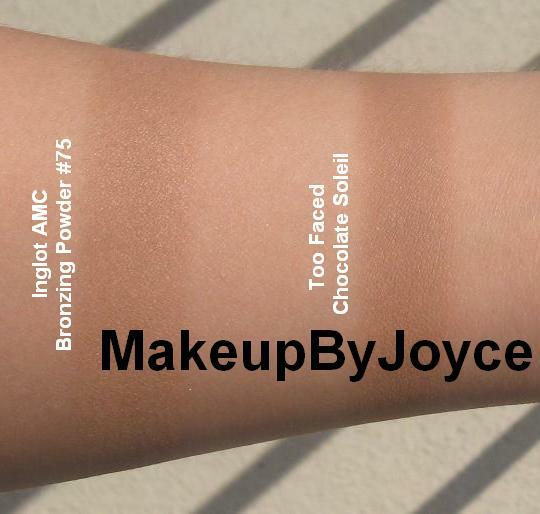 When compared to Too Faced Chocolate Soleil (review & swatches), AMC #75 has a yellow undertone to it. When I got home, I did a little research and found out that AMC meant Advanced Makeup Component. Still, that tells me nothing about the shade, texture or finish. So, I emailed Inglot, but they never replied back to me. See how dusty, crumbly, and messy it gets? 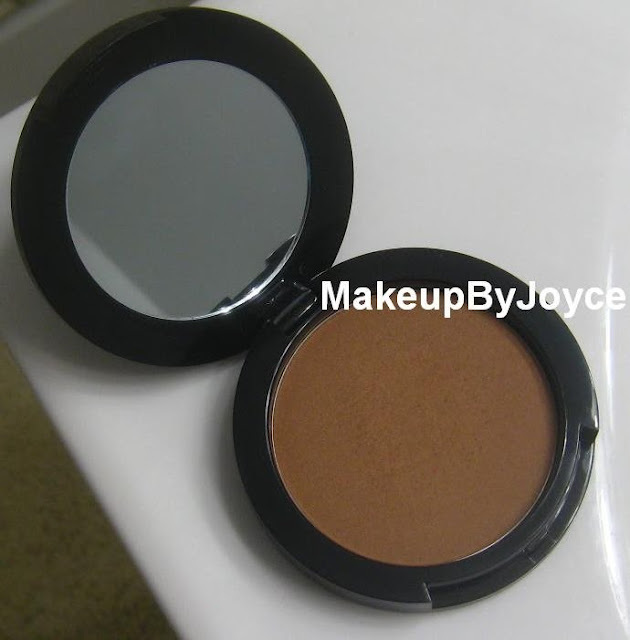 If I'm contouring, I always reach for Chocolate Soleil because it is completely matte and looks natural. 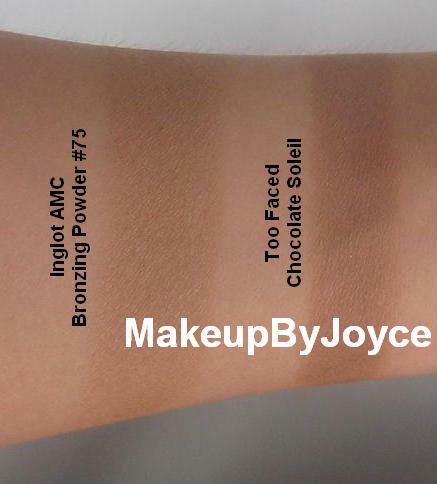 As for AMC #75, I prefer to use it as a bronzer because I can see microscopic gold shimmers & a gold sheen upclose under artificial lighting and it looks extremely shimmery under direct sunlight, which looks very unnatural, especially if you're using it to contour. It only looks good & natural from a short distance (1ft or farther) in indoor lighting because I can't see the gold sheen or shimmer. 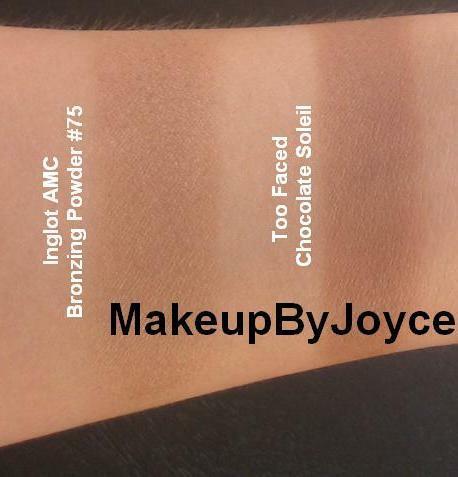 Just keep in mind that AMC #75 is more suitable to use as a bronzer and not for contouring. Another thing that I'm not too fond of is the formula of the product. It's very dusty and even if you are tapping the brush lightly into the pan, it still makes a mess in the pan. I've also tried pressing the brush firmly into the pan and it doesn't make a mess; however, the brush ends up picking up too much product that way, and then I have to tap off the excess; thus, it still makes a mess in the pan. Another important thing to mention is that I've only used the Inglot bronzer less than 10 times, but there's already a dent in the pan! I've used my other bronzers and blushes more than 20 times; however, I've barely made a dent in any of them and they still look like new. The problem with Inglot's bronzer is that the formula is smoother & more crumbly, and this is also the reason why it makes such a mess in the pan. No doubt, I will hit pan faster even if I don't use it as much as my other bronzers and blushes. 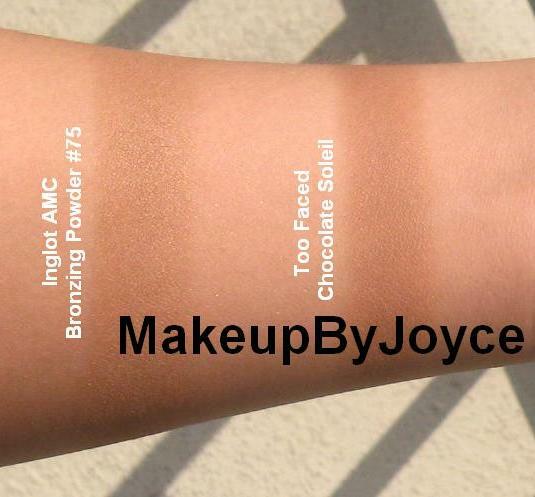 The product looks very pigmented when I swatch it with my finger and onto my arm; however, the shade is not dark enough for me when I apply it on my face. It only gives me a hint of warmth to my cheeks, which might be good for someone who wants a "minimal makeup" look. I like more color on my cheeks because lately, I've been lazy with my eye makeup, and have been just wearing eyeliner & mascara. 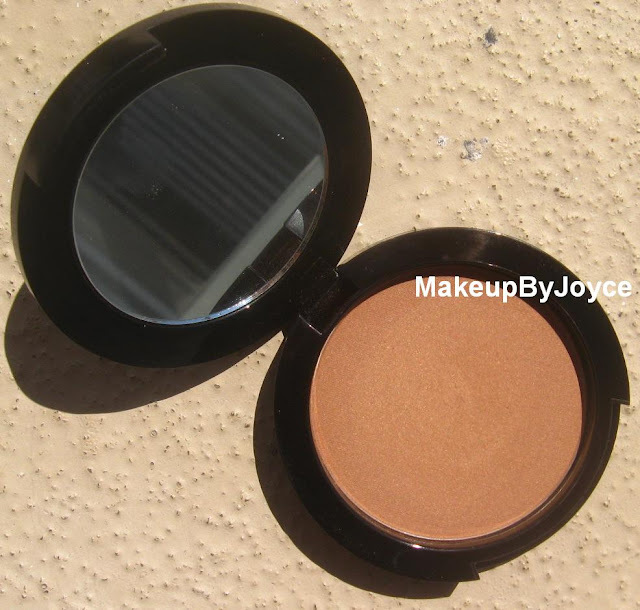 So, I like wearing Mac's My Paradise Cheek Powder (review & swatches) underneath the AMC #75 bronzer because that combination gives me more color on my cheeks and dimension to my face. (Usually, blush is worn on top of a bronzer; however, I find that My Paradise looks better under the Inglot bronzer.) I just hate that I have to pair it with another product just to make the color work. Note: The Inglot AMC #75 Bronzing Powder retails $18 for 9 grams. I got mine for $14.40 because I received 20% off from an Inglot store. Too Faced Chocolate Soleil costs $28 for 10 grams and Mac's bronzers retails $21-$24 for 10 grams. 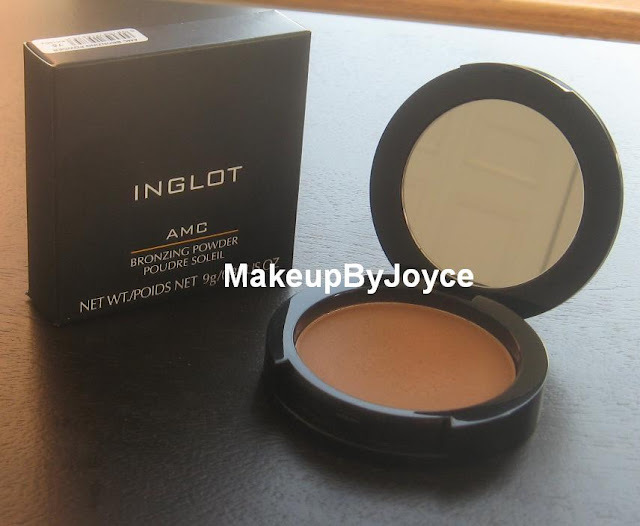 Have you tried any of Inglot's bronzers?